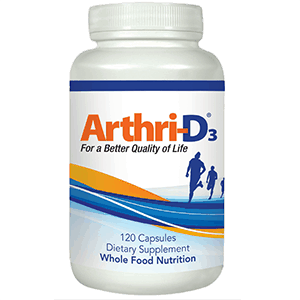 ArthriD3 ‘s all-natural proprietary blend of antioxidants, phytonutrients, vitamins and minerals promises to provide your body with the nutrition it needs to feel good and be able to be active every day. This product is not specifically targeted to reduce pain or swelling associated with joint ailments, rather, it provides nutritional support to enhance overall good health. The recommended dosage is to take 2 ArthriD3 capsules twice daily (2 in the morning and 2 in the afternoon or evening). This supplement may be taken with or without food, but the manufacturer suggest that taking it with a meal will help maximize the benefits. Anyone who is allergic to shellfish should not take this product. As with any supplements, you should consult your healthcare practitioner before taking this product especially if you are pregnant, lactating, taking any other medication, have food allergies, or if you have any medical conditions. One bottle of ArthriD3 should last you a month and it sells for $109.99. You can enroll in its Monthly Replenishment Program and receive one bottle monthly for $89.99. It offers two cost-savings programs: three bottles for $219.98 and five bottles for $329.97. ArthriD3 comes with a thirty (30) or ninety (90) day money-back satisfaction guarantee depending on the amount of bottles purchased. If you have purchased one bottle (30-day supply) you have a thirty (30) day guarantee, and if you have purchased three or more bottles (90-day supply or more), you have a ninety (90) day guarantee. Any consumers who are unsatisfied with their purchase of ArthriD3 can contact the manufacturer to return all items purchased (opened and unopened bottles must be returned) for a full refund. Shipping and handling charges are non-refundable. There are a few positive consumer reviews featured online for ArthriD3. We value the money back guarantee that the manufacturer of ArthriD3 offers because it really lets consumers purchase the product with confidence, knowing that if they are dissatisfied they can obtain a refund. We were disappointed that ArthriD3‘s formula is not targeted at joints specifically and that it doesn’t include key ingredients such as MSM (Methylsulfonylmethane), Ginger or White Willow that contain fantastic warming and anti-inflammatory properties that are beneficial for joints. In addition, excluding consumers who are allergic to shellfish seems unnecessary. Why not just make the supplement clean of allergens? The customer reviews are mostly on the product’s website and cannot be taken at its face value. Mark Stevens	reviewed ArthriD3	on April 7th	 and gave it a rating of 3.5.